Herald De Paris West Coast Editor Al Carlos Hernandez had a chance to reflect with Gregg, a truly a great guy, about his stellar career. His journey began in the Northern California mid-sixties, where Gregg recalled meeting Carlos Santana. GR: “I actually met Carlos in a tomato patch. What happened was a friend of mine saw Carlos play at the Fillmore on a Tuesday night, which was “locals” night. Bill Graham would put on local bands that could just come in and play. My friend saw him play, came and told me about him, and then decided he’d go find him. He went into San Francisco — I lived in Palo Alto, which is 30 miles south. He went and found him working at a Tic-Toc’s hamburger place in the Mission District, and invited him to come down and jam. He drove him down to Mountain View and we played at somebody’s house. AC: What was your original vision for Santana? GR: At the time we wanted to be an international band. We wanted to be huge. Coming from San Francisco was wonderful but it’s a big world out there and we wanted to play to everybody. We looked at ourselves and tried to be like the people we admired, which were jazz greats and blues greats. We approached our music in that fashion. It just seemed to have an impact. It kept growing and growing and people loved it. We just kept doing it. We were a group of guys doing the blues-based music that we enjoyed playing. We wanted to be a big band; our focus was much larger than a local scene and I think that added to that attitude. AC: Lately there has been a lot said and written about the 40th anniversary of the Woodstock music festival. I asked Gregg about the Woodstock experience. GR: I was talking to Mike Shrieve (Woodstock Hall of Fame drummer for Santana) about this. I guess I’ll have to make up some stories because I don’t remember much. AC: For many of us, seeing Santana playing Soul Sacrifice on screen changed our lives. GR: Interestingly enough, we had our own problems. There were tuning problems because it was outside. The instruments back then didn’t have the tuning heads that lock in like they do now. All the technology that’s going on is now is much more advanced, so you don’t end up with quite the same problems. Bill Graham, who was a mentor to us, got us the gig without even having an album out yet. It really came together on “Soul Sacrifice.” The band played well and it was energetic. We got put in the middle of that movie. If you were at Woodstock and in that movie, you had a career. And that’s pretty much what happened. It just kick-started the whole thing internationally for us. Our reputation preceded us playing Woodstock. We’d never been on the East Coast and that was our first trip. We played a couple of gigs out there. People knew of the band from San Francisco because that was the place where it was all coming from. Back then it was like what Seattle was in the 90s for the whole grunge scene. We (Santana) flew in to Woodstock, and I remember Barry Imhoff, who worked for Bill Graham, was in there with us. He said, “Look at all those people down there!” I looked down, and it didn’t really strike me, because it looked like ants on a hill, peas on mashed potatoes or something. It didn’t really strike me at all. We had played in front of 10,000 people, but I had no consciousness of what 500,000 people looked like. From the helicopter, it looked like a lot of people. So we landed since you couldn’t drive in anymore. Everyone had parked on the highway and blocked everything. We got there and played, and looking out, it didn’t bother me too much because you could only see so far. Past that all you could see was brown – all the hair. So it wasn’t frightening because it didn’t gel. We’d played, as I said, to 10,000 before. Thank God it didn’t, because I’d probably have been scared to death knowing what was really going on. I remember staying to watch Sly & The Family Stone because I wanted to see him play, and we left after that. They drove us out, and that’s when it hit me -just how big this was. It took forever to get through 500,000 people in a car. It was pretty amazing. If you were there and you played, and then got into the movie, you had a career. Speaking of driving, Gregg is a hot rod enthusiast, and almost missed the Rock and Roll Hall Of Fame induction ceremony because he was working on the restoration of a ’32 Ford. He is currently building a ’56 Chevrolet that will corner like a Porsche. He plans to tour his Chevy at auto shows. AC: Rock folklore has it that you once walked into a luxury auto dealership and bought an exotic car in cash. True? Gregg left Santana in 1972 after four very successful groundbreaking albums. AC: Why did you leave Santana while the band was still red hot? GR: I guess Mike Shrieve said it best this way: “It was too much, too soon, A bunch of young guys on top of the world.” It just got to everybody. But at the same time, the one thing that we had in common was the music and that drive for the music. We did not know each other all that well so when the music faltered, we didn’t know how to express to each other what was going on, going wrong, or why. I look back on it and it was a moment in time that was really special and great for me. It was kind of painful towards the end but I look back and it was great. What was accomplished by the six musicians (seven with Neal) was a whole different kind of music that no one had ever done before – an approach to music that no one could ever replicate. We were in the middle of making it happen – just striving to do what we did. It all came together in that little point in time and I’m glad it all happened. I listen to that music and, to this day, I could go right back to it. 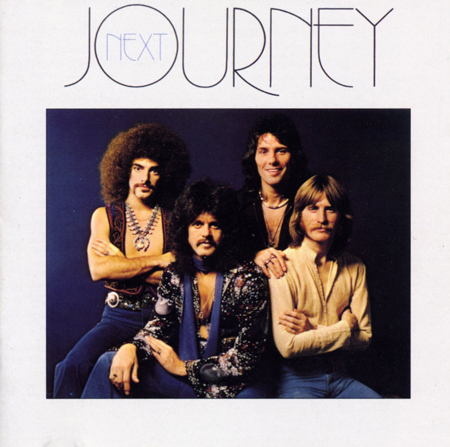 AC: It was right after that when you and Neal Schon formed Journey. What was the plan behind putting that band together? GR: Actually, I had opened a restaurant in Seattle with my father when I got a call from Neal and Herbie Herbert, the manager. You know, it was “What are you doing? You wanna do this?” And I said, “I’ll give it a shot.” It was really like that. I didn’t have any plans of being in the music business after Santana. They were very serious about it, and I was kind of like, “Okay, let’s see what it is.” Pretty soon it turned into a full-fledge band and we really went after it. Journey had to be built. Santana was a phenomenon — we built Santana and worked hard on it as well, but it happened pretty quickly. Journey took a long investment to make it happen. AC: Journey started as the Golden Gate Session band, which was like a progressive rock thing. Then it went really pop – what do you feel about that? AC: After a few albums Journey hired Steve Perry to take over most of the lead vocals. You two sang together on those early radio friendly hits. Tell me about that. GR: I liked doing that. I liked having a lead singer. It didn’t bother me at all. I had been the lead while playing keyboards and harmonica. It was pretty spread out. I thought it was a new challenge, a new way to go. Why not? Steve Perry had a great voice. It was that simple. AC: Okay, again, you are at the top of the Rock food chain and then you quit Journey. Why? GR: I left to start a family. I was really tired of the road. I’d built two bands and had been on the road for fourteen years. It was the end of it for me. I didn’t want to travel anymore. But look what I’m doing now with the Greg Rolie band. I’m doing the same thing. At the time, I wanted to change my life and so I did. I made a conscious effort to start a family and I’ve done that Now the wife and kids have kicked me out of the house, now that the kids are grown up. Journey attained multiplatinum success in the 80’s. Gregg returned briefly to the Santana fold before going on hiatus to start a family. Rolie eventually came back to music, working on various one-off projects including Abraxas Pool. Pool included all of the original Santana members with the exception of Carlos and bass player David Brown. The Gregg Rolie band is releasing its first concert DVD, recorded at the Sturgis Rally, and has issued a live CD entitled Rain Dance, a must for any Santana/Journey fan. GR: The DVD is about an hour. We were slotted for an hour and I’m known to be pretty good with timing at this point in my career. If you need an hour, I can play an hour. It covers the material from Santana that I did with (Michael) Carabello and the original band. It covers Santana from the first three albums, as well as new material that is unreleased and also includes material from the Roots CD I put out in late 2001. No Journey tunes. The band has timbales and congas, and that doesn’t really work (laughs). I basically went back to the roots of where I started. When I sit down and play the piano, that’s the kind of the music that comes out. That’s the way it happens. So I just went to whatever was comfortable. That’s what I was weaned on, so that’s where I went. Mike Carabello plays with me and he was the original conga player with Santana. The timbale player is Adrian Areas who is Chepito’s son. Alphonso Johnson played bass with Santana – actually playing longer with the band than I did after I left. I was there for about five years and I think he played for about six, so Al’s played the Santana stuff as well. I’ll just tell you the rest of the lineup. Ron Wikso played with me in the Storm and has played with many, many people as well. I’ve known him for fifteen years. Actually, he’s kind of the instigator of the whole thing because I was in a hammock and he kind of dragged me out of it. He’s the drummer. The keyboard player is Wally Minko. He played with Jean-Luc Ponty and Tom Jones and a host of others. He’s very much like Alphonso — the list is so extreme and we don’t have time. The guitar player is Kurt Griffey, who’s virtually unknown to people, but he’s a shredder. He’s a phenomenal player. He plays all the signature lines that he needs to play, takes it to where he wants to, and it does not miss at all. This is the Gregg Rolie Band. There is no doubt that if Gregg can strike mulit-multiplatinum twice with two legendary rock bands, the smart money is on the fact that he could do it again – whenever he wants to. gregg has rocked forever god bless music. Thanks for decades of great music and vocals Gregg! Given what’s happened to rock music for the last 10 years or so, I’m finding myself going back in time through my collection and finding myself in the Journey and Santana sections A LOT!! I’m 45 years old so was lucky enough to grow up as a rock music fan starting around 1969 right up through the Grunge years, so I can’t complain – pretty good stretch. You could argue that 1969-1994 were the best 25 years in rock history, no? I always new that you were part of the corner-stone of Santana. I’ve always enjoyed hearing you and Gregg Allman playing and vocals. If ever you are in need of a guitarist. I am the one! heh heh…seriously though! I’ve been a classically trained pianist for most of my life, and Rolie has provided massive inspiration to me. He’s almost Baroque in the ornaments he adds — not an arrogant virtuosity at all, but a joyful one. He and Händel are the only keyboardists who can get a piano to wink and wiggle its backside. Every time I hear Bach’s Gigue Fugue I think of Gregg Rolie! Hey, your Realtor here. Saw you are coming to Ramona and wonder if you can send some details so Garry and I can buy tickets. Gregg, i’m a huge fan -when might you come to the Yakima or even Seattle area for a show?